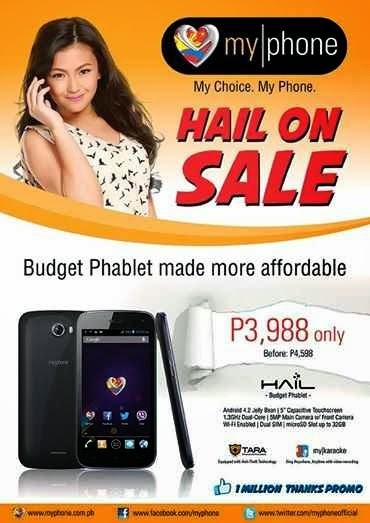 You can get more affordable Android phablet as Myphone Agual Hail now drop it price from its original SRP. This serves as their thanksgiving promo to one million fans and counting on Facebook. Save up to 600 pesos and get it now under 4000 pesos, to be exact it's P3988 only. A budget smartphone for those who prefer receiveing calls and texts the whole day, social networking thru Wi-Fi and minimal gaming and apps. It runs on Android Jellybean 4.2 so you enjoy and download latest OS compatible apps and games on Play Store. This phone has 5-inch screen size with FWVGA display resolution and 5 megapixels rear camera. MyPhone Hail features is simple and enough to who want to try Android environment without hurting your budget. YOu can take photos that you can upload to Facebook, Twitter, Google+, Instagram and other sites and use its front VGA camera for video calling app like Skype and WeChat. You can still consider this phone for business use as you setup an email client on it like Microsoft Exchange and Gmail. Though you only have 2 connectivity from 2G to Wi-Fi, I think this not a problem as there are lot of free hotspots available or you can go for Pcoket Wi-Fi. For 2G connectivity, all you need to do is set the right GPRS./EDGE/APN settings on your phone to use cellular data. You can also check closely related Android smartphone MyPhone Rain 2G, 3G Version and Agua Storm. Agua Hail is now available on your nearest MyPhone store and kiosks or you can order online via MyPhone Online Store. Check this list of stores and inquire more details on this unit.